While this article was originally when iCloud2 was introduced many, many years ago, some of the issues raised back then remain a problem today, such as messages getting stuck in the Outbox. iCloud error: The set of folders cannot be opened. In some versions of Outlook and iCloud, you may be able to set iCloud data files as the default data file in Outlook. However, it is not recommended at this time and is not supported. See iCloud default data files for details. If you don't see your iCloud contacts first when you click the To button, the iCloud contact folder is not set as the default list in the Address Book Options. If iCloud is not listed in the Address book drop down, you need to right click on the iCloud Contacts folder, choose Properties and enable it as an Address book. See "Contacts are missing when you click the To button" for more information. Additional Outlook-icloud articles are listed at the end of this article, with the newest articles at the top of the list. The Notes field in Appointments and Contacts use plain text format in iCloud. This is "by design" due to frequent complaints about the formatting getting messed up during the sync process. Additionally, the date fields in iCloud appointments do not support natural language. You need to type the date in full short date format (2 digit year ok). Users are reporting outgoing messages getting stuck in the Outbox after installing iCloud. iCloud is marking the messages read when you look in the Outbox. You'll know the message was marked as read by the icon - its no longer a closed envelope and is the draft's paper and pen icon instead. The solution: stop looking in the Outbox or stop using iCloud. To resend, open the message and switch to the Inbox then click Send on the message. Do not look in the Outbox. Disable iCloud, verify email sends correctly then re-enable it. Move the message from the Outbox to the drafts folder or delete it. Open it from Drafts or Deleted Items then Send again. I tried to disable iCloud using the Outlook Trust Center but it won't let me. It keeps telling me only an Administrator can do this and I am one. The set of folders cannot be opened. The information store could not be opened. You need to re-sync the iCloud data file. close Outlook, open the Control panel and search for Mail. Select Data Files. Select iCloud from the list of accounts then click the Settings button. Close Outlook and reopen Outlook. 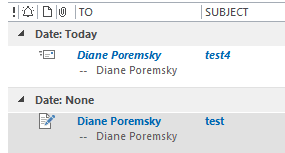 Hello Diane, My Iphone and Outlook calendar have recently stopped synching and I noticed that I not longer have a "'Move to iCloud" buttong on the Appointment task bar on my PC. I am using Outlook 2010 and the iCloud Add-in is not disabled. Would you be able to help me resolve the issue? First step is to sign out of icloud then sign back in. A comment above says: "Reverting to iCloud 1 will fix these issues (but it cannot be set as default data file)." What does does the "it" refer to in that sentence, as in "it cannot be set"). What are the benefits, if any, of being able to set "it" as the default data file? I don't know what a default data file is. This related to Outlook 2010 with iCloud AddIn. For most people, the most noticeable thing is that the data file holds the appointments that display on the to-do bar. 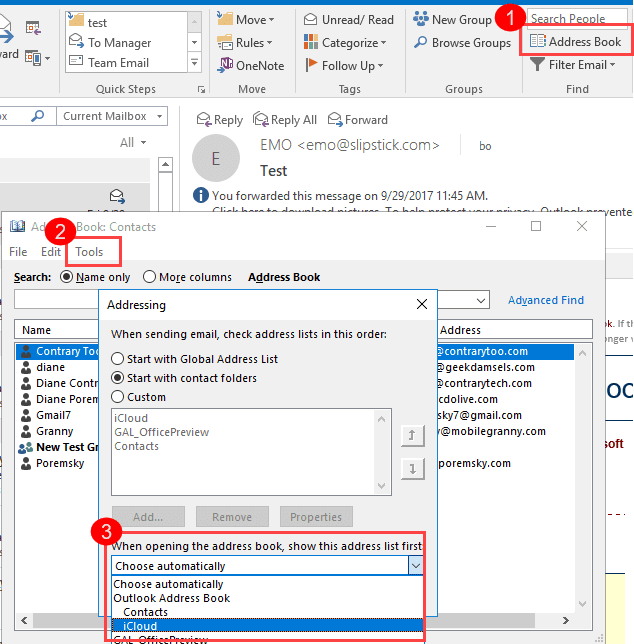 Because of the way Outlook 2010 handles accounts, the default data file is less important for mail handling and to to-do bar drives the default. The iCloud data file can't be set as the default data file in some builds of iCloud. When the iCloud data file can be set as default, the to-do bar displays appointments that are in the iCloud and newly created appointments may be saved directly in the iCloud (under some circumstances). When the folders where your calendar and contacts are is set as default, the user "experience" is generally a little better. Having major problems with outlook 2010 and windows 8. Downloaded icloudsetup 2.1.2 and installed. However, outlook wont let me send email out from my mac account or any of my other email accounts (gmail, work). Uninstalled and reinstalled icloud. No joy. Uninstalled icloud and installed icloud 1.1. Outlook wont open. When i reinstall icloud 2.1.2 - i can open up outlook, see emails but cannot reply or send emails from mac account or other email accounts.....so back to square 1. Your mac account is imap and you need a pst file set as default to use imap accounts with iCloud. You cannot set the iCloud as the default data file. File, Account Settings, Data File, Add... set a pst file as default. You can use an existing pst file, but not the imap data file. The error relates to the iCloud - removing the iCloud service from your profile should fix it, if you don't want to use icloud. (Control panel, search for Mail and edit the profile - remove the iCloud from the data files tab). Hi there! Thank you for all you do and share. I thought I'd return the favor by sharing a problem and answer. I moved my contacts to iCloud, and a view I had created stopped working. Found the answer at this location. Apparently iCloud contact folders don't recognize categories for filters. They are working here - but you need to use a "contains" filter, not a "is" filter. category:("Category") finds all items with category in the category name. category:="Blue Category" finds items only in the blue category, as iCloud sees "blue category, green category" as one string, not two separate strings. This works in View filters too, but you need to use "contains" not equals. That article is not accurate re: IMAP. The iCloud *email account* is IMAP and imap does not support categories, without a little trickery. The actual iCloud data file used for calendar and contacts is a SQLite database. Categories work pretty much the same in iCloud as they do it outlook, with just minor problems. When you uninstalled/reinstalled, did it remove the icloud from the profile? If not, sign out of the icloud and sign back in. Thank you, Diane. That solved the problem! iCloud Control Panel was installed successfully after repairing Office 2013, and it allows me to sync iCloud with Outlook 2013 now. I had two versions of Outlook installed on a windows 8 PC. I'm unable to get iCloud Control Panel to recognize Outlook 2013 is installed after removing Outlook 2010. 1) Install microsoft office 2010 including Outlook on a Windows 8 PC. 2) Install microsoft Outlook 2013 as well. 3) Install iCloud control panel. 4) sign in to iCloud Control panel. I receive a message saying there are two versions of Outlook installed, and to uninstall one of them. 5) Uninstall office 2010 from Control Panel add/remove programs. 6) sign in to iCloud Control panel, and there are no options to sync with Outlook presented as there would be expected--just a reference to go to icloud.com for contacts, etc. Question, is there a registry item left after uninstalling microsoft office that tells iCloud there is no outlook on the system now, even though outlook 2013 is still installed? If so, can I edit the registry to fix this? I would repair Office 2013 install then open it to make sure the profile is working. Then close it and try icloud again. Also, make sure you have at least icloud2.1 - that is the first version to support 2013.
i am using windows 8 x64 with out look 365 latest version..
Icloud set up mine when i set up icloud - I'm using p06-imap.mail.me.com and p06-smtp.mail.me.com; port 995/SSL for incoming and 587/TLS for outbound mail. I understand they go up to p99- for the server names.